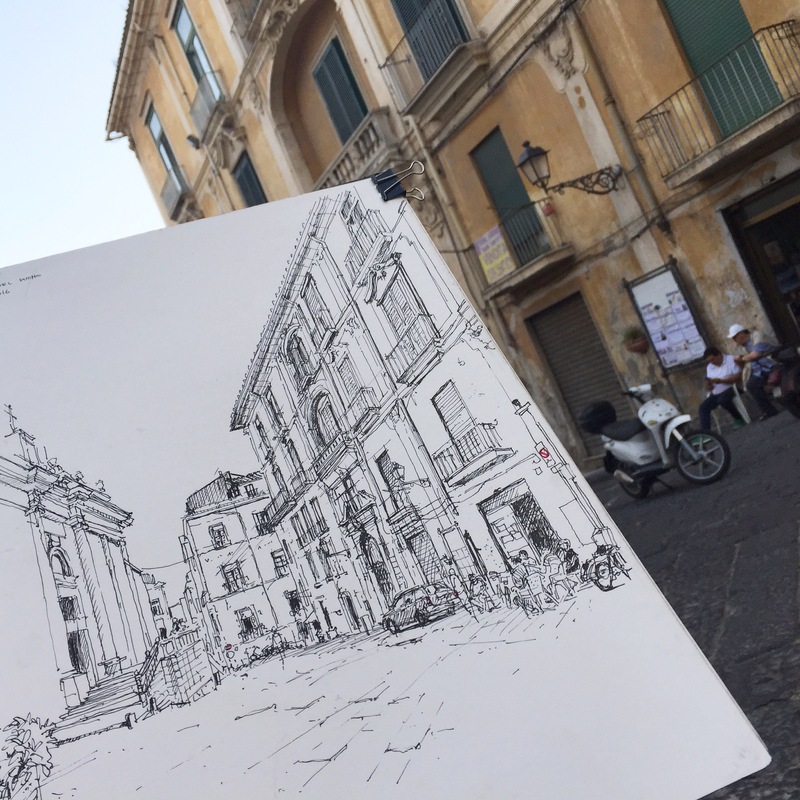 Fir this afternoon I choose to draw a lovely Fiat 500 parked close to the Duomo of Salerno. It’s dangerous to sketch subjects that can move, before you finish your work (it has happened to me several several times! ), so I tried to finished the 500 as soon as possible leaving the street and buildings to the end. In fact the Fiat left before I finished the sketch, although I had already drawn almost all I wanted from the little car. 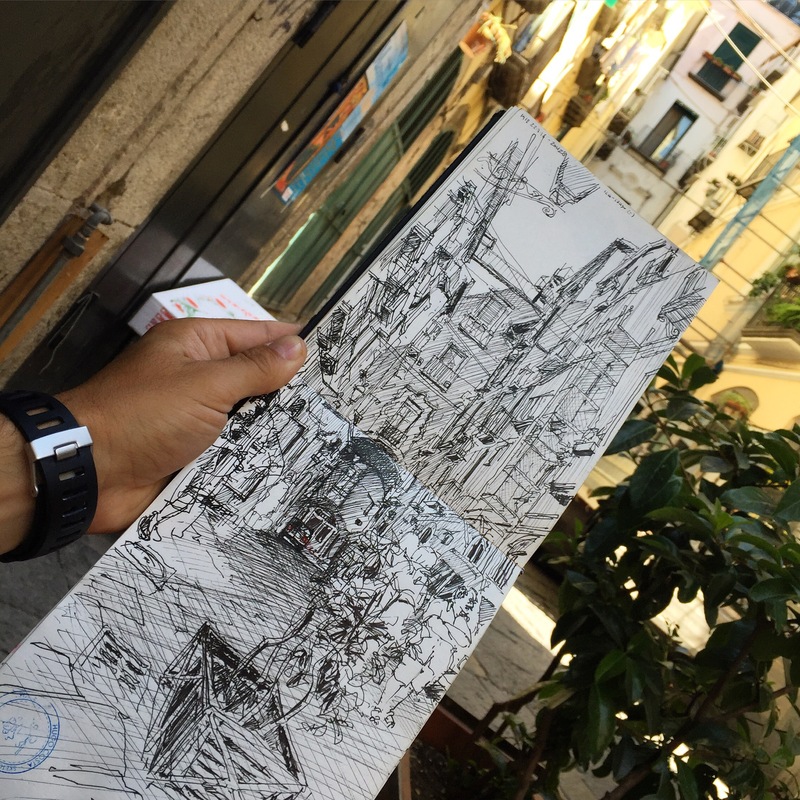 Salerno’s old town: a lot of lines this time. 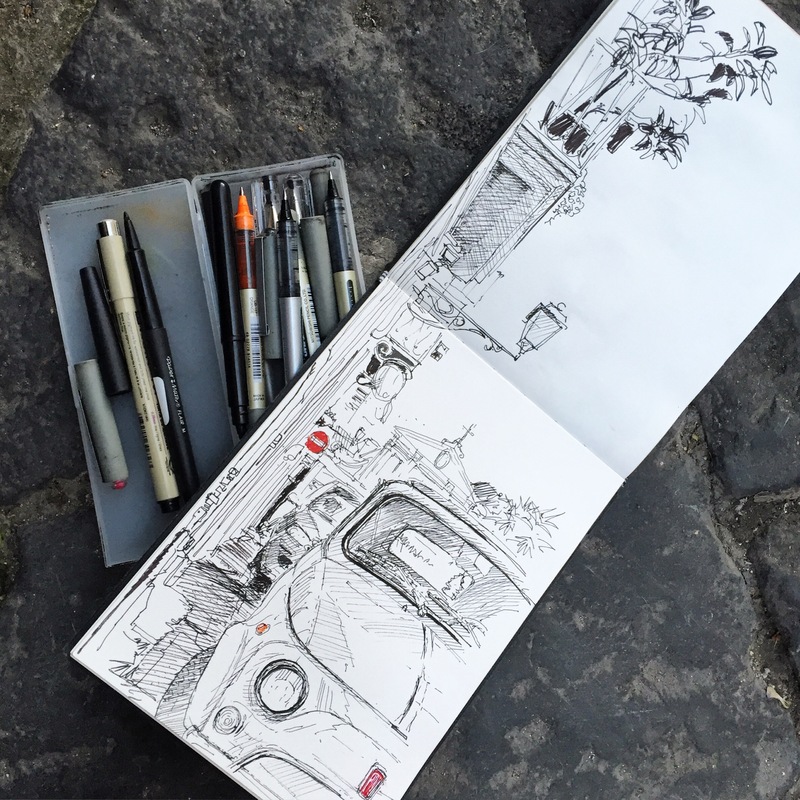 This sketchbook is perfect for “vertical” streets! I was expecting some Vespa or other vehicle to park next to me as usual, but this time I had nothing more interesting to draw than these plants on the foreground. 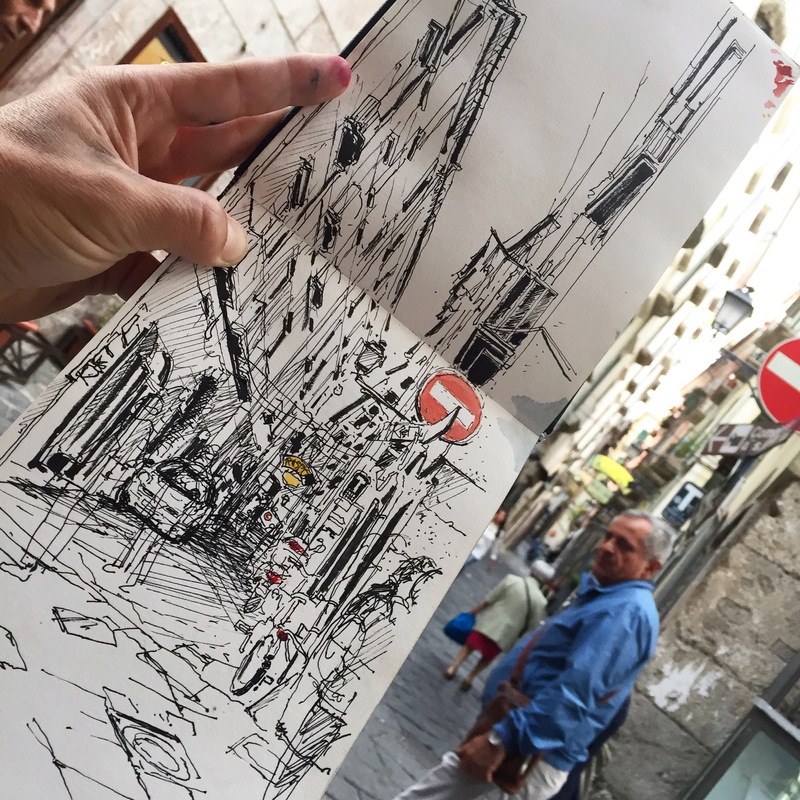 It was hard to sketch the foreshortened buildings! Via dei Mercanti, Salerno. It’s hard to sketch here on a Saturday afternoon. I had to draw in between all the people that was crossing in front of me. 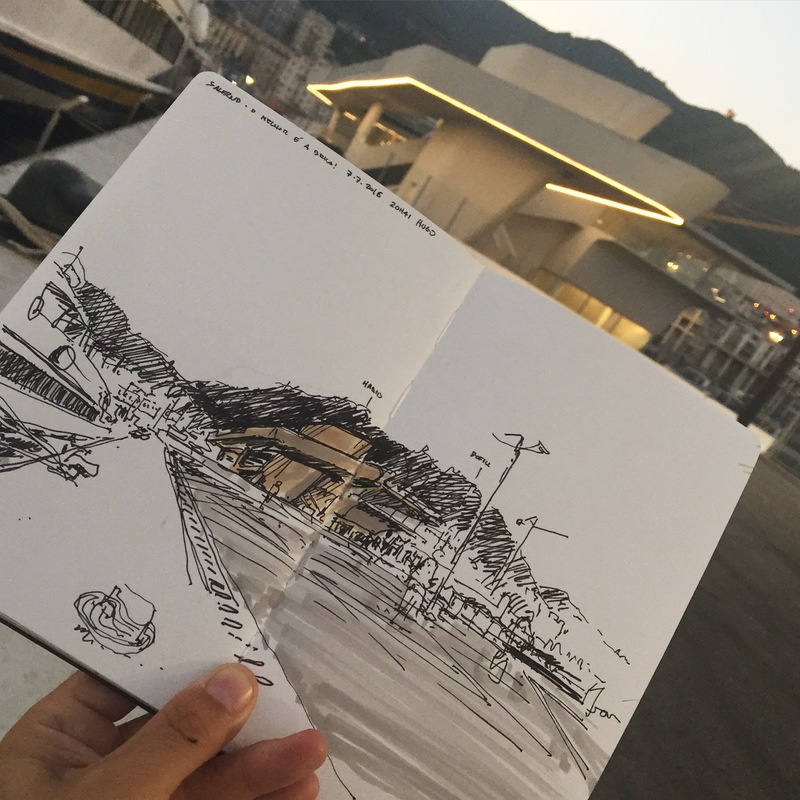 Salerno Maritime Terminal by Zaha Hadid. When I took the ferry to Capri, was expecting to somehow use the fancy terminal, instead, I bought my ticket in a old container. At the end of the day, the building looked nicer under this beautiful light. Yesterday I tried to finish this sketch under the moon (and electric) light. Nevertheless, I was unable to gather some details of the magnificence Palazzo at the square. So, I returned there this afternoon, as well the old men on the plastic chairs.